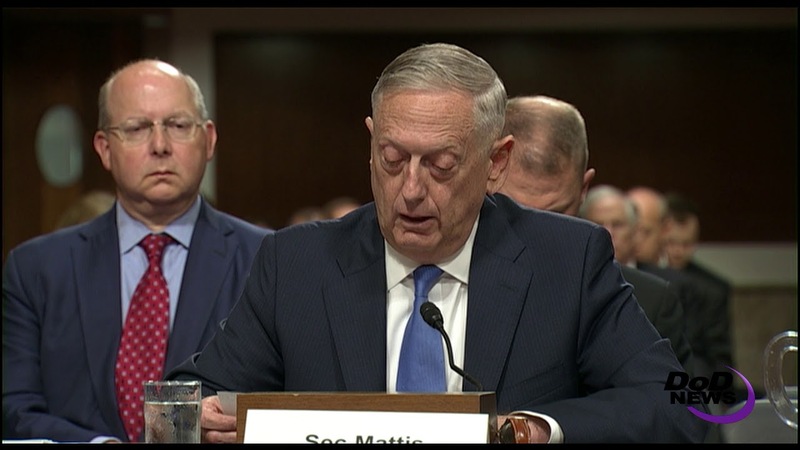 The certainty engendered by President Donald J. Trump's South Asia strategy already is paying dividends in Afghanistan, Defense Secretary Jim Mattis told the Senate Armed Services Committee today. "While we continue to make gains against the terrorist enemy in Syria, Iraq and elsewhere, in Afghanistan we have faced a difficult 16 years," the secretary said, adding that the strategy is aimed at improving conditions on the ground and putting in place Afghan forces that can protect their fellow citizens. "Beginning last month, and for the first time in this long fight, all six Afghan military corps are engaged in offensive operations," Mattis said. "During these recent months, there have been fewer civilian casualties as a result of coalition operations, although regrettably, Taliban high-profile attacks on civilians continue to murder the innocent." The Taliban are still a threat, he said, and Afghan forces are taking them on with support from U.S. and NATO advisors, air power and resources. The United States has roughly 11,000 troops in Afghanistan, and NATO and partner nations have deployed 6,800. There are 320,000 Afghan forces. "From these numbers, you can see the Afghan forces remain the main effort, and we are supporting them, not supplanting or substituting our troops for theirs," Mattis told the committee. "Violence and progress in Afghanistan continue to coexist, but the uncertainty in the region and the NATO campaign has been replaced by certainty due to the implementation of President Trump's new South Asia strategy," the secretary said. "This strategy has been welcomed almost uniformly by leaders in the South Asia region as well as the 39 countries contributing troops to the NATO-led campaign." The goal, he added, is a stable and secure region and that can only happen if the Taliban reject support or conduct of terrorism. The bumper-sticker version of the strategy is "4R+S," the secretary said: regionalize, realign, reinforce, reconcile and sustain. "Regionalize" recognizes that challenges exist beyond Afghanistan, Mattis explained. "The strategy adopts a geographic framework with a holistic, comprehensive view," he told the senators. "India, Pakistan, Iran, Russia and China were considered at the outset, rather than focusing only on Afghanistan and then introducing external variables late in our strategic design." "Realign" is a shift in emphasis in advising Afghan forces to lower levels. Advisors will support or teach at the battalion and brigade level. "The fighting will continue to be carried out by our Afghan partners, but our advisors will accompany tactical units to advise and bring NATO fire support to bear when needed," the secretary said. "Make no mistake, this is combat duty, but the Afghan forces remain in the lead for the fighting." "Reinforce" refers to the increase of 3,000 U.S. troops now arriving in Afghanistan. The secretary said he expects more forces will come from NATO and partner nations. "In light of our new strategy, 15 nations have signaled that they will increase their support," he told the panel. "Again, certainty having replaced uncertainty, we are now looking to our partners to provide even more troop and financial support." "Reconciliation" is the desired outcome from military operations. "Convincing our foes that the coalition is committed to a conditions-based outcome, we intend to drive fence-sitters and those who will see that we're not quitting this fight to reconcile with the Afghan national government," Mattis said. "Our goal is a stabilized Afghanistan, achieved through an Afghan-led, Afghan-owned peace process. "War is principally a matter of will," he continued, "and the international community is making clear that it will stand alongside the Afghans committed to this fight." "Our South Asia strategy reinforces to the Taliban that the only path to peace and political legitimacy is through a negotiated settlement," he said. "It is time for the Taliban to recognize they cannot kill their way to power, nor can they provide refuge or support to trans-national terrorists who intend to do us harm."